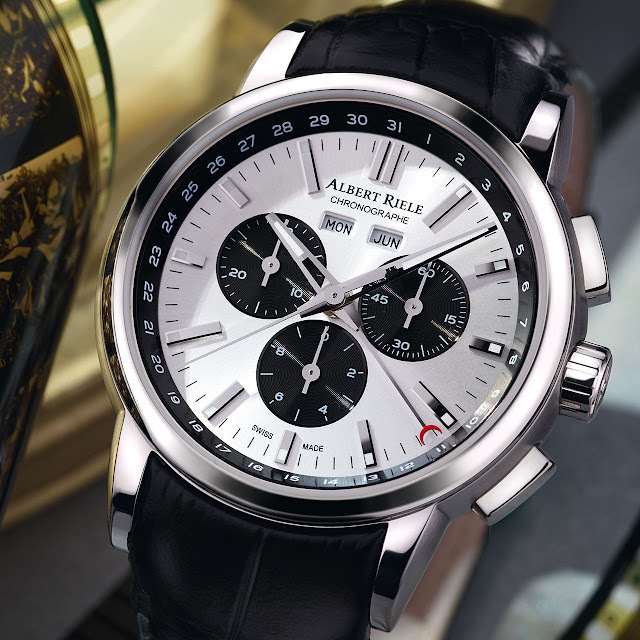 The incarnation of the aesthetic and creativity of Swiss brand Albert Riele, this chronograph seals the launch of its flagship Premiere collection. Its design is rooted in classic lines, drawn out by a myriad carefully orchestrated details that instil a contemporary touch. Elegant contrasts take form such as the mat black chronograph counters that stand out against the silvered dial. They are echoed by the inner bezel ring that is circled by a date scale. The expressive hands with their robust architecture offer maximum legibility, including at night thanks to the luminescent coating that also covers the hour-markers. All this is brought to life by a quartz movement, the Ronda 5040.F calibre. The watch is delivered on a leather strap with an additional steel bracelet.